A half-scale model of NASA's Laser Geodynamics Satellite (LAGEOS), which celebrated its 40th year in space in May 2016. A giant disco ball has been monitoring the Earth from space for forty years — and will continue to hang there for millions more. The NASA satellite, dubbed LAGEOS — short for Laser Geodynamics Satellite — celebrated its 40th year in space on May 4. The craft was launched from the Vandenberg Air Force Base in California in 1976. NASA officials describe the orb's construction in this retro video from NASA's archives. 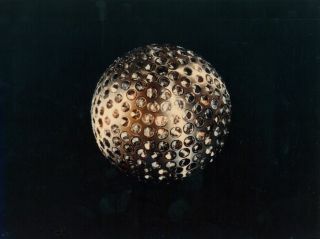 The retroreflectors, which reflect light with minimal scattering, made LAGEOS the first NASA orbiter to use a technique called laser ranging to take measurements. By sending light to LAGEOS and measuring how much time it took that light to bounce off the reflectors and make it back to Earth, NASA scientists could make measurements to millimeter-level precision of how far away LAGEOS was from the ground. Those measurements over time revealed how the ground stations were moving relative to Earth's center of mass. A model of LAGEOS, a 900-pound (408-kg) satellite launched into orbit in 1976. "At the time, people couldn't believe that we could actually range to a satellite orbiting at that altitude with such high accuracy," Erricos Pavlis, a researcher with the University of Maryland, Baltimore County, said in a statement. Previous satellite laser-ranging technologies could measure with an accuracy of up to 3 feet, but LAGEOS made it possible to measure distances from the ground to the satellite's orbit — which is 3,600 miles (5,900 kilometers) above the Earth — within half an inch. Over the past 40 years, NASA has used LAGEOS to measure the movement of Earth's tectonic plates, detect irregularities in the rotation of the planet, weigh the Earth and track small shifts in its center of mass via tiny changes in the satellite's orbit and distance from Earth. At the time of LAGEOS' launch, the theory of plate tectonics was already established and supported by evidence of seafloor spreading and magnetic patterns in the crust. But scientists still wondered whether the plates were currently moving, how much they were moving and how they related to earthquakes. "What had been missing was a way to measure the speed and direction of plate movement over time," Frank Lemoine, a geophysical scientist at NASA's Goddard Space Flight Center, said in the statement. LAGEOS provided scientists with that ability, as well as the ability to detect small shifts in the Earth's rotation that are caused by movement of mass in the atmosphere and oceans. Ranging to LAGEOS also revealed the migration of Earth's axis of rotation as well as changes in the satellite's orbit, which helped scientists develop early models of the planet's gravity. "Today, we see Earth as one system, with the planet's shape, rotation, atmosphere, gravitational field and the motions of the continents all connected. We take it for granted now, but LAGEOS helped us arrive at that view," David E. Smith, who was the LAGEOS project scientist at Goddard and is now at the Massachusetts Institute of Technology in Cambridge, said in the statement. When LAGEOS-2, an identical sister satellite that travels in a complementary orbit, was launched in 1992, it opened up even more possibilities for data and eventually confirmed a prediction from Einstein's general theory of relativity: Small perturbations in the satellites' orbits around Earth matched up with a "frame-dragging" effect that the theory predicted (also called the gravitomagnetic or Lense-Thirring effect). That's not the only drag effect LAGEOS has measured. It also showed proof of the Yarkovsky effect, which says that an object that is heated from sunlight on one side will later emit that heat and experience a small, slowdown force. Both of the drag forces, as well as others, lower LAGEOS' orbit by about one millimeter each day. Eventually, the forces will bring LAGEOS crashing back to Earth, but scientists don't expect that to happen for about another 8.4 million years. So for the foreseeable future, the disco ball lives on.